Would you wait 2 hours for a lettuce? Funafuti, located 1,000km north of Fiji looks fantastic and you would be forgiven for thinking you could grow whatever you wanted. The reality is growing food at home here is actually harder than it looks. For the people of Funafuti (one of the larger islands in Tuvalu), growing food at home is almost impossible due to sea water rising through the coral scree in high tides, salinating any crop planted in the "ground". The average elevation is only 1.83m above mean sea level. It is amazing to visit a place that literally doesn't have topsoil! Given that water supplies are 100% dependent on roof water capture, irrigating a large traditional garden is simply out of the question. What about the 2 hour wait for a lettuce? Well, that is the reality for householders who get up at 7am to stand in line for a weekly ration of lettuce and cabbage and maybe a few cucumbers from the local community garden. Once the available green produce is handed out, that's it for another week folks. Imagine that happening at your local supermarket. Not surprisingly, given that home farming is difficult, poor diet ensues as cheap imported food - high in fat, salt and sugar - is consumed and the community has a high rate of diabetes and other diet related health issues. 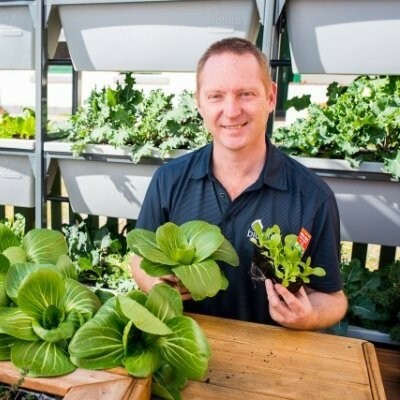 Following a global food challenge in early 2017, Australia's Department of Foreign Affairs and Trade (DFAT) commissioned Biofilta to undertake a trial of our raised, self watering and wicking garden beds to assess whether the issues of a lack of water, limited availability of compost and rising sea levels could be addressed and healthy food could be grown in small available spaces. The first phase involved a scoping trip in December 2017 with the team to assess the opportunities and challenges in setting up food growing systems in a place that considers any compost as "gold". We met with local businessman Andrew Ponton who has started an NGO called Growing Tall with the aim of setting up vertical gardens in Tuvalu. 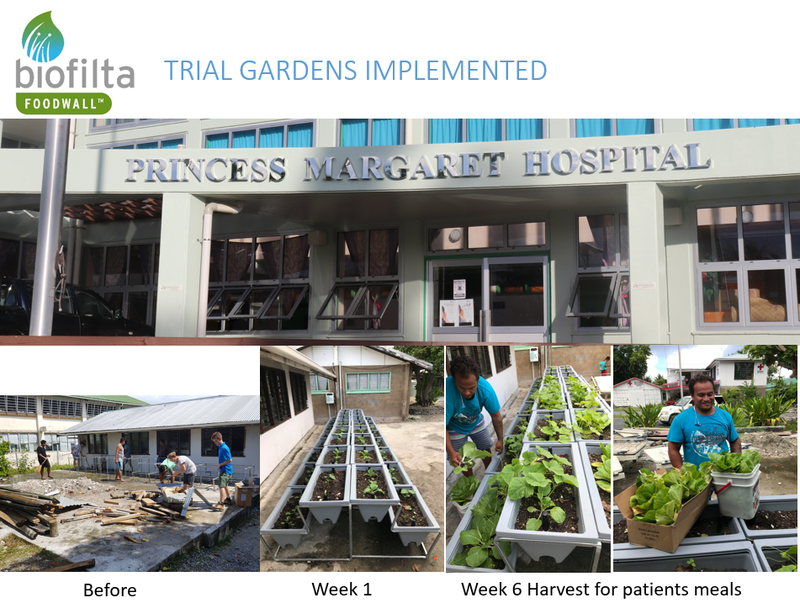 Through the assistance of Growing Tall's in-country labour and knowledge, trial gardens using our Foodwall Step system were deployed across the island. We also had excellent support from all stakeholders and government who were very interested in the opportunities for the community. A total of 50m² of garden area was deployed in this phase of the project. 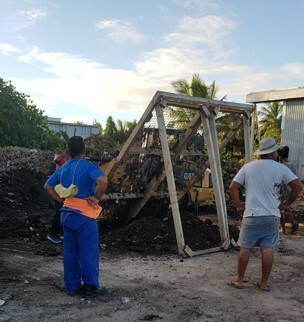 Working with the local green waste collection agency, slow composted palm and other green material was sifted and delivered to various sites for installation in the Foodwall tubs. 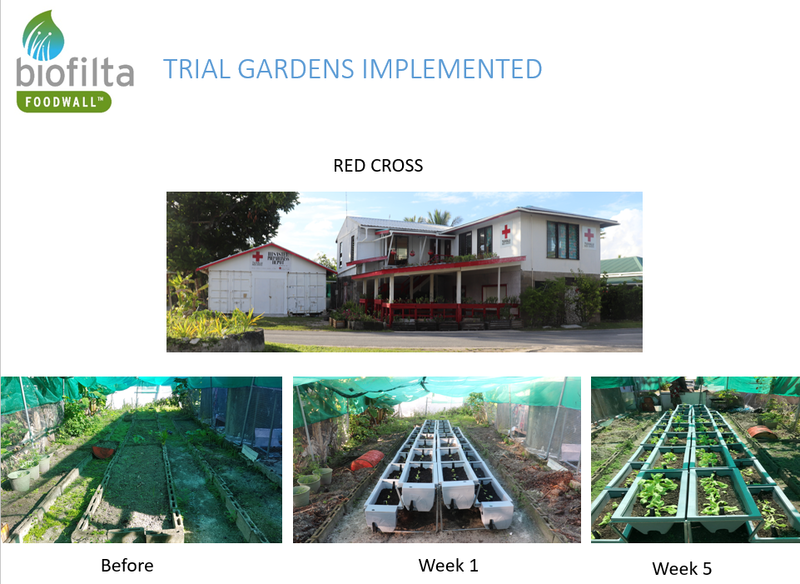 The installation team then set up the trial gardens and developed a monitoring regime of weekly visits by our in-country garden champion Faatupu Semeti who recently graduated with a science degree from New Zealand. The systems were planted with locally sourced seedlings and water use, plant health, pH and other metrics are meticulously recorded. The above Red Cross site has a full time gardener who takes pride in keeping the site as green as possible. He is also very entrepreneurial. So far, feedback has been overwhelmingly positive and many people are now seeing how fresh food can be grown at home with little water input and by using locally made compost. The Foodwall systems collect and store water from direct rainfall and many of the sites are yet to require any additional water from drinking supplies in 7 weeks. The technology of the wicking garden bed has been proven successful in about the most remote and inhospitable (for growing food) on the planet! Water use from the Foodwall system isn't seen as a big problem given that the system uses the stored water in each tub and so far, general rainfall exceeds the plant's water uptake requirement. The island receives 3,000mm of rain per year. 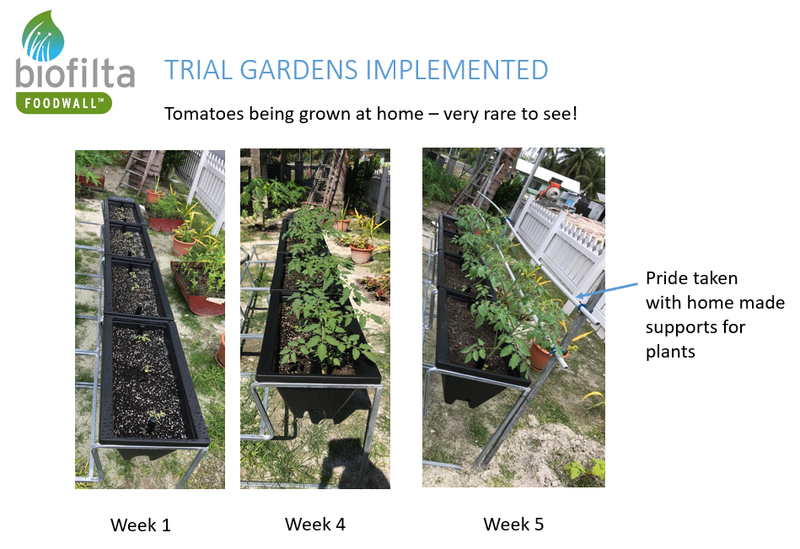 Over 60 families have now registered for a home garden since the beginning of the trial. Biofilta is now planning to return in late 2018 to implement a second 50m² of Foodwall for families that missed out in the first round. Monitoring and evaluation continues on a weekly basis to see how the crop yield tracks and we will start to experiment with different crop types. Our goal is for everyone to grow their own food and not have to wait for 2 hours for a lettuce. This article first appeared on Biofilta's website here. Thanks for the information, it’s always great to know about new places, people and their lifestyle.